As the end of the construction process approaches, we began to look over each program we are attempting to qualify for. This process involved a detailed review of each program’s checklist and re-reading of the detailed explanations that accompany them. Each program has differing requirements for qualifying. LEED® for Homes has pre-requisites for various categories that must be achieved before any points can be attained in that category. 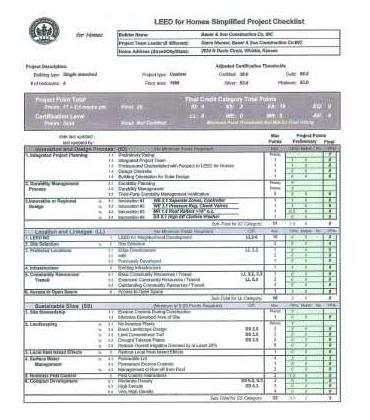 The NAHB Green Building Program has a minimum number of points that are required to achieve a rating in each category and all categories must have the same rating to achieve that overall level of rating or certification. 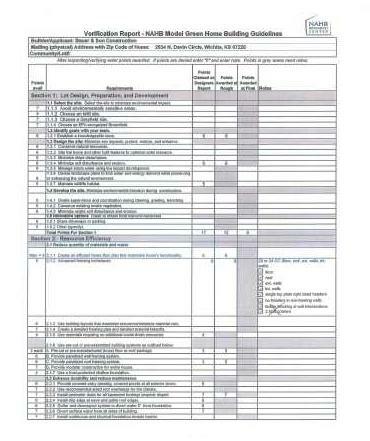 The ENERGY STAR® and Indoor airPLUS programs require that each item on their checklist be achieved in order to receive the rating, The Builder’s Challenge program is the least restrictive and has many items that are recommended as best practices but have exceptions based on local practices. Prior to starting construction on the house, each program checklist was used to develop specifications for each phase of the process. 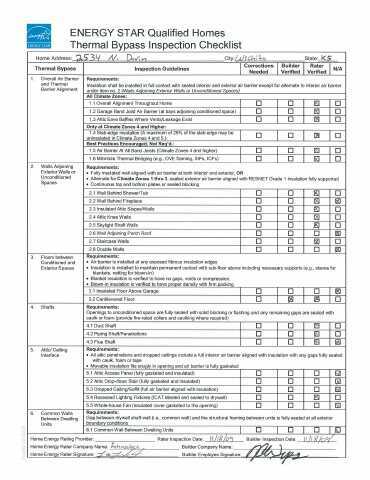 If an item on a checklist was unclear, we referred to the detailed explanation for clarification. Our initial reading of “Bituminous membrane installed at valleys & penetrations” which is item 1.9 in the Water-Managed Roof Assemblies on the Indoor airPLUS checklist, seemed to be satisfied by our standard practice of totally covering the entire roof of the house with UL 15# asphalt saturated felt and then installing metal flashings in the valleys. While conducting our review of this item, the term “self-sealing” was included in the detailed description. We considered reworking the roofing to comply, but decided not to because of cost and weather conditions. While we are still on track to quality for LEED for Homes – Gold certification, NAHB Green Building Program – Gold certification, ENERGY STAR, and the U.S. Department Of Energy’s – Builder’s Challenge programs, we regret the loss of not qualifying for the U.S Environmental Protection Agency’s – Indoor airPLUS rating. Interior work continues as the landscaping is going on outside. The electrical contactor is installing the light fixtures, ceiling fans and the carbon monoxide detectors. 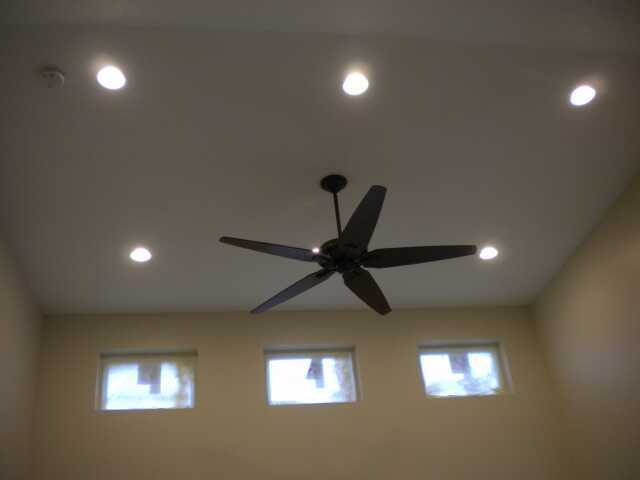 Recessed ceiling light fixtures with trim ring, baffel and CFL lamp installed. 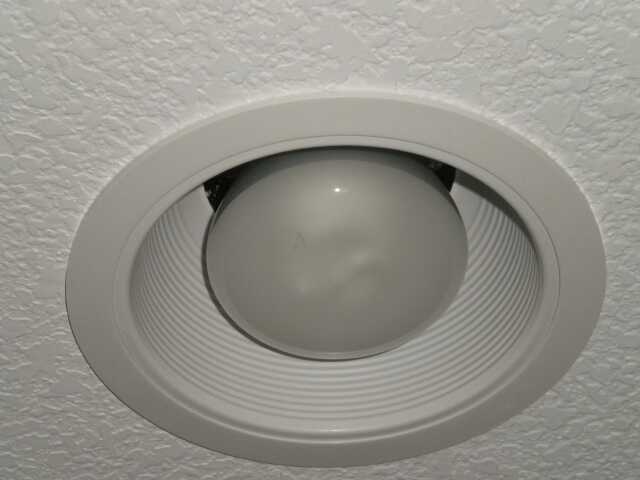 CFL lamps used in the recessed ceiiing fixtures. 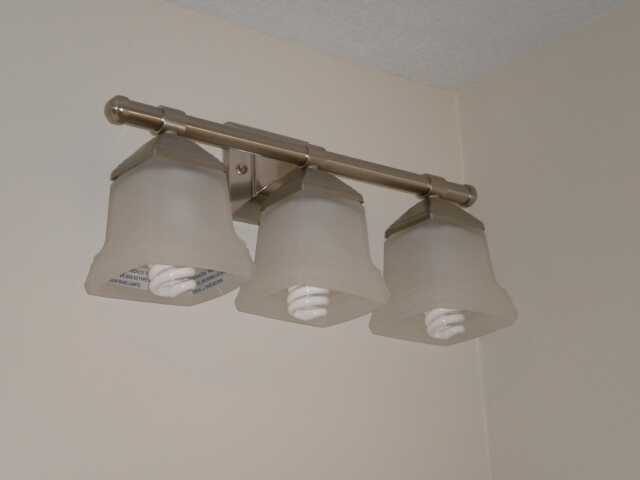 Bath vanity light fixture with CFL lamps. LEED® for Homes, U.S Environmental Protection Agency’s – Indoor airPLUS, and the U.S. Department Of Energy’s – Builder’s Challenge programs all require the installation of carbon monoxide detectors. 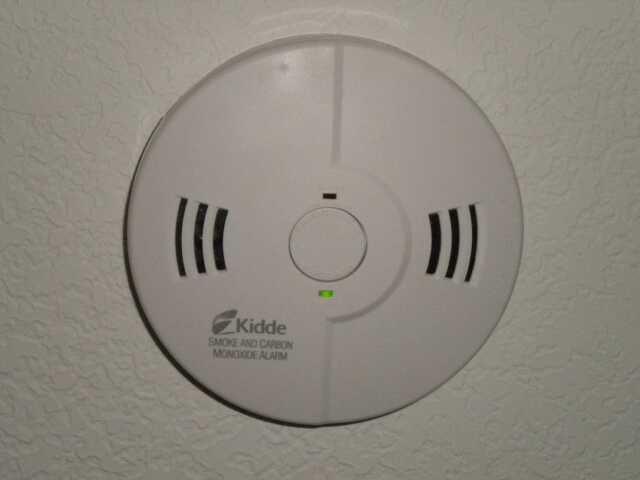 Combination smoke and carbon monoxide detectors are installed on both the Main Level and the Lower level of the house. Independent third party verification is a key part of LEED® for Homes, ENERGY STAR®, NAHB National Green Building Program, the U.S Environmental Protection Agency’s – Indoor airPLUS, and the U.S. Department Of Energy’s – Builder’s Challenge programs. 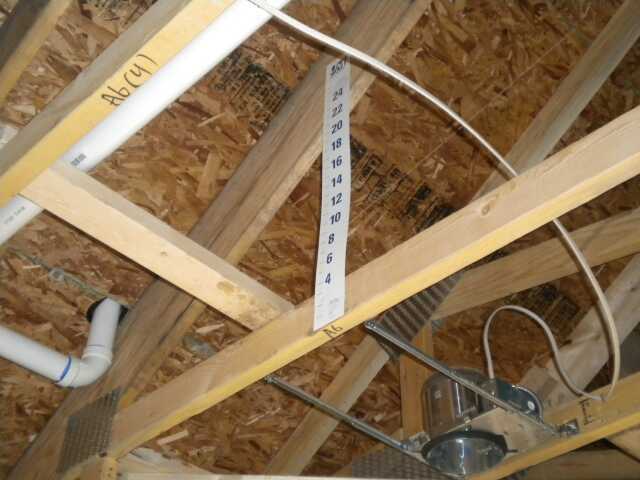 Inspectors or raters check the home for compliance with each program’s requirements. 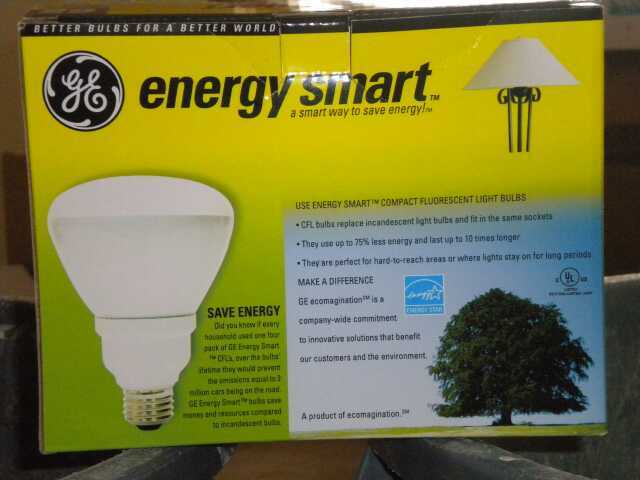 Qualifying as an ENERGY STAR® home is a mandatory minimum level of energy performance required for LEED® for Homes. 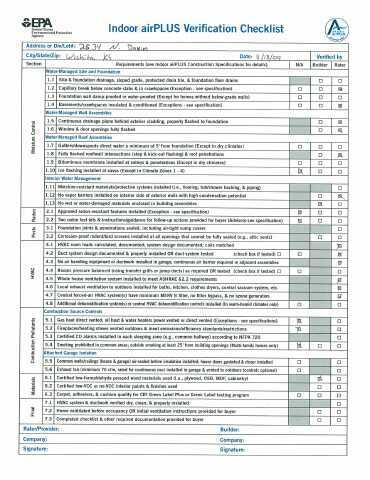 Completion of the Thermal Bypass Inspection Checklist is the first step of the qualification process. 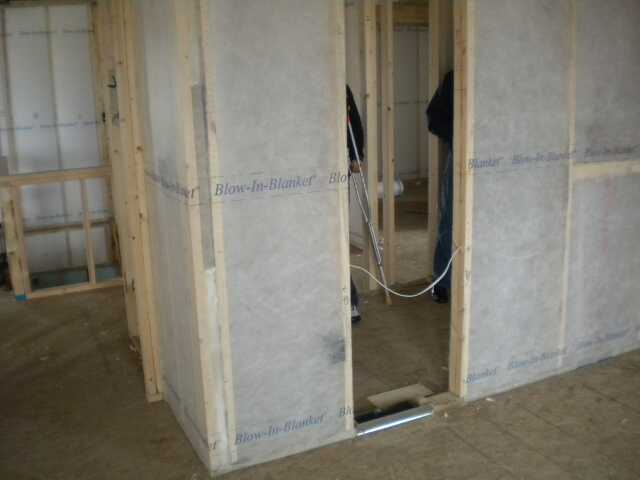 At the same time the Thermal Bypass Inspection was being performed, so were the 1st inspections for LEED® for Homes, the NAHB National Green Building Program, and Indoor airPLUS. 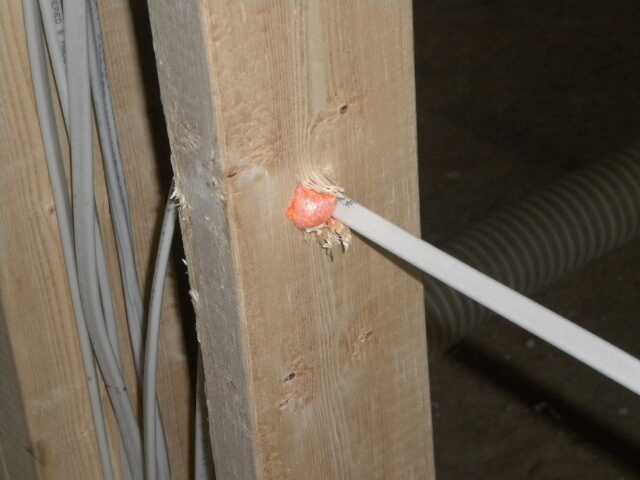 The process of insulating the house begins by sealing all holes and cracks where air leakage might occur. Air leakage can cause indoor air quality problems, condensation, excess energy use, and comfort complaints. Leakage from outdoors to indoors is known as infiltration and leakage from indoors to outdoors is known as exfiltration. Dow Great Stuff Pro™ Gaps & Cracks insulating foam sealant is sprayed around wiring from the attic through the top plate of an interior wall. Holes in top plate that were drilled and then not used are filled the foam. This is done to eliminate air movement inside the wall cavity. Holes in studs are filled the foam. 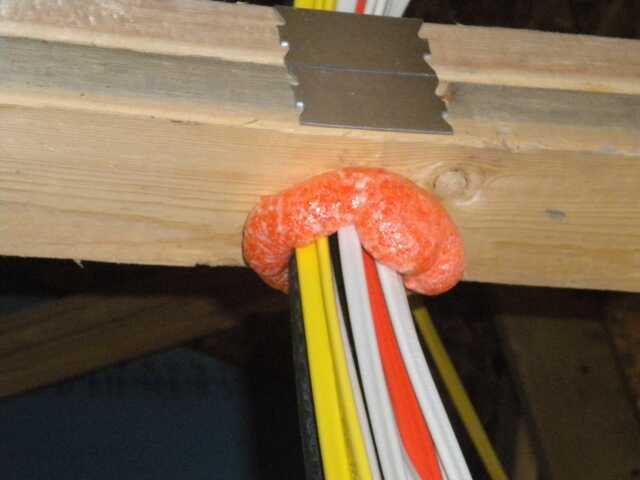 This same foam is applied to wire openings in all electrical boxes. 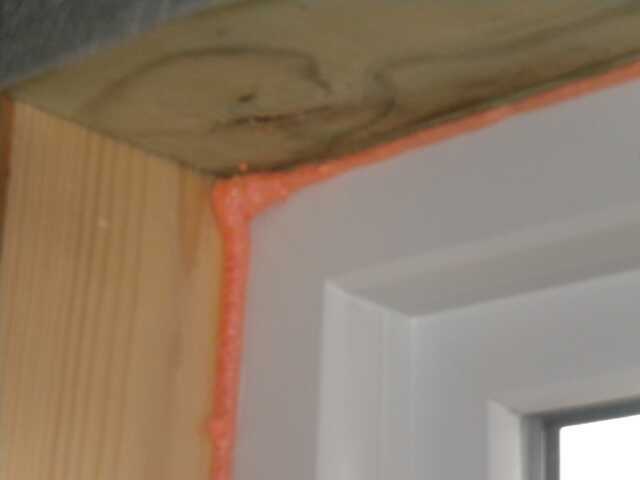 The same is applied to the shim space around all windows and exterior doors. 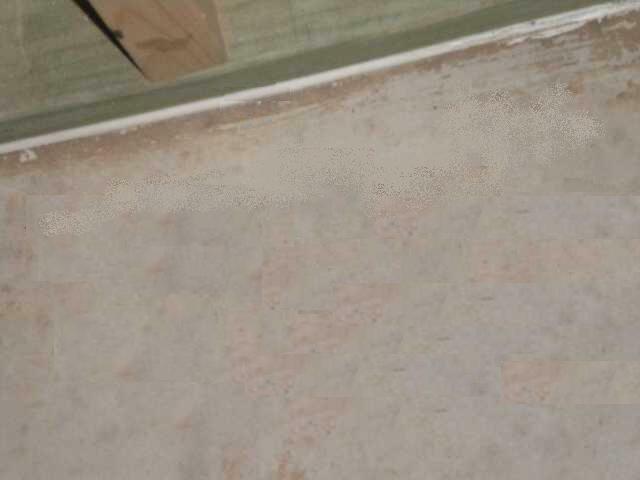 The joint between the bottom plates of all exterior walls and the floor is caulked. This includes the basement walls as well. 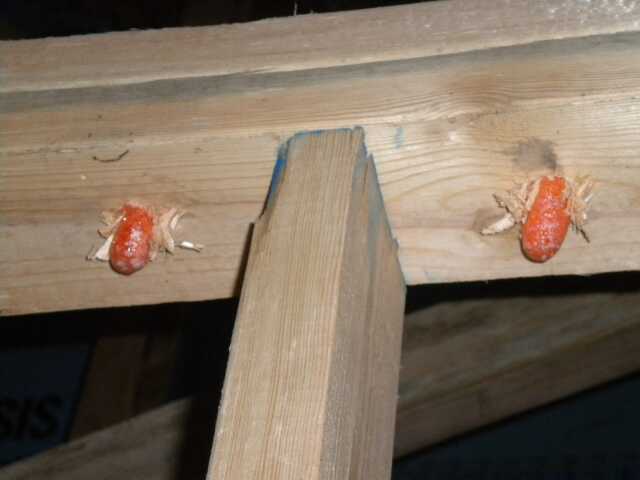 The insulation system for the walls is Johns Mansville’s loose-fill fiber glass Spider Custom Blow-In-Blanket with an R value of 23. Since it is fiberglass it will not hold moisture, it will not support mold growth, it will not rot or decompose and is non-combustible. The system is formaldehyde-free, and contains no acidic fire retardant chemicals. Part of the insulation system is netting that is stabled to the studs on all the Main Level exterior walls. View of West Kitchen wall. Netting installed on the South Living Room / Kitchen wall. 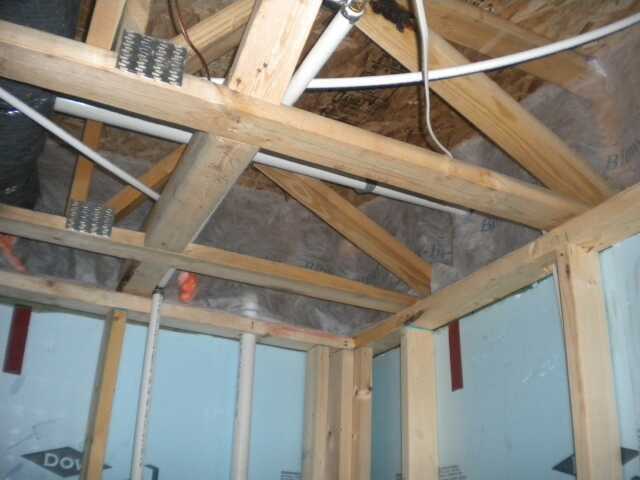 The rim joist space is enclosed with the netting in order to be filled the insulation. 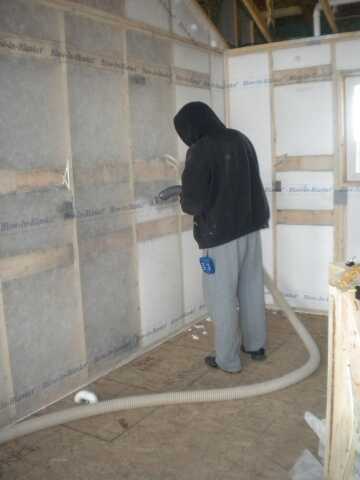 Insulation being blown into the netted stud space. 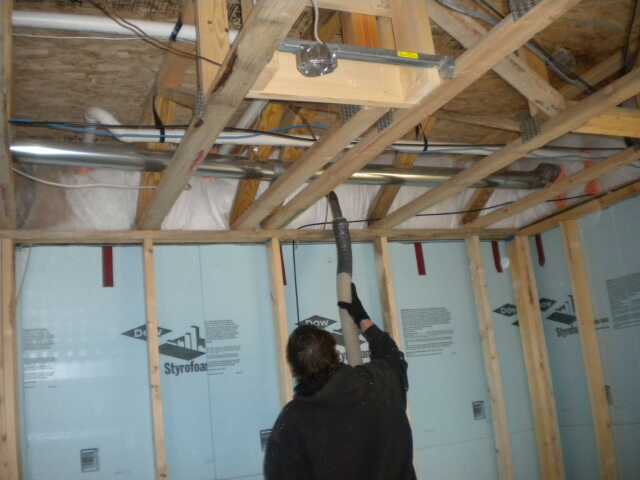 Insulation being blown into the netted rim joist space. 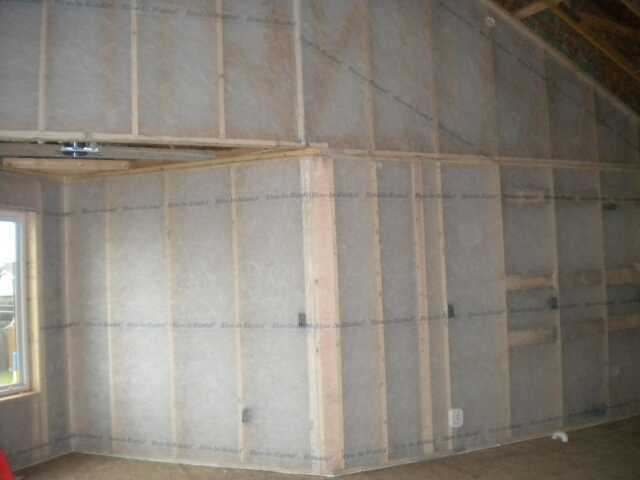 Selected interior walls were netted on both sides and filled with insulation to reduce sound transmission from one room to another. Insulation applied around the skylight tubes. 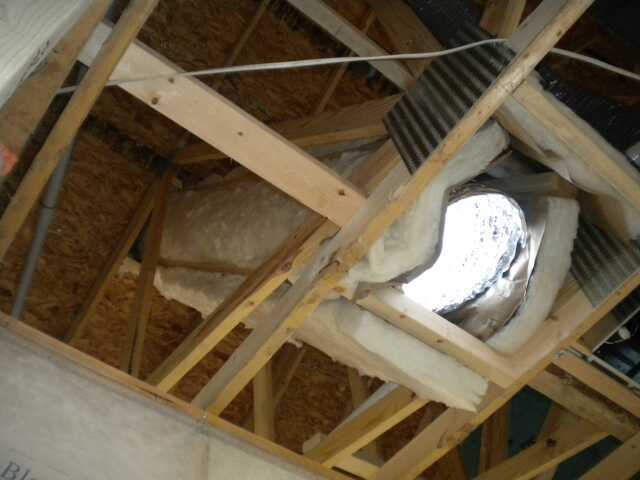 Air chutes are installed at all soffit vents to keep attic insulation from blocking the air circulation in the attic. 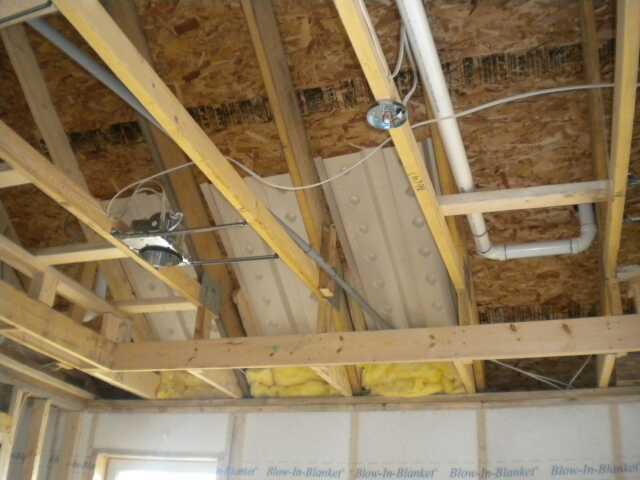 Batt insulation is installed in the vaulted ceiling above the Kitchen. 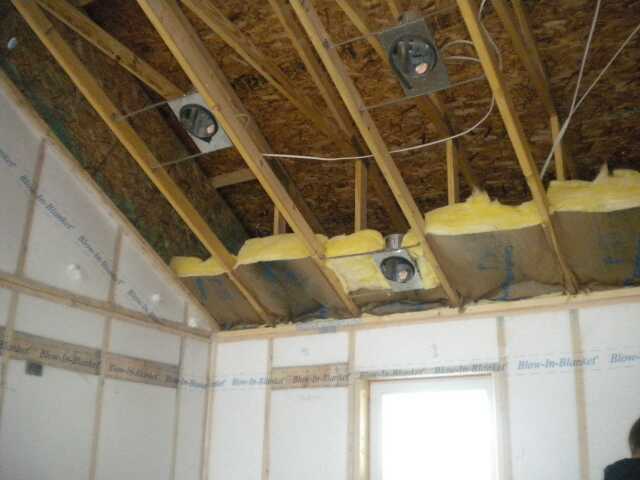 After the drywall is complete, the Attic is insulated with Johns Mansville Climate Pro/Attic Protector formaldehyde-free loose fill fiberglass insulation for an R value of 38. 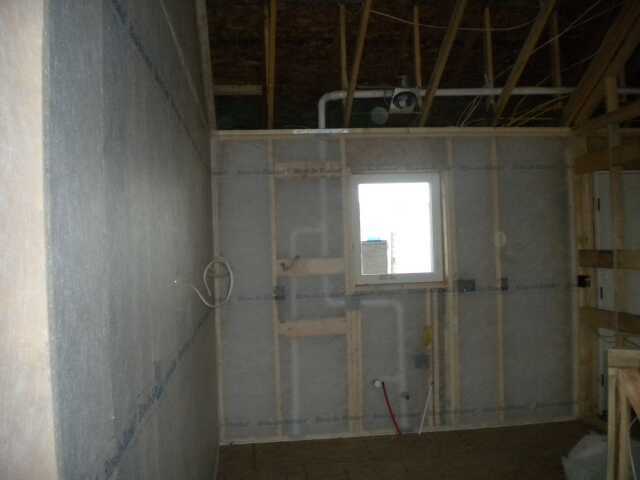 View of the East wall of the East Basement Bedroom with blown in insulation above and the rigid Styrofoam on the concrete view-out wall below. 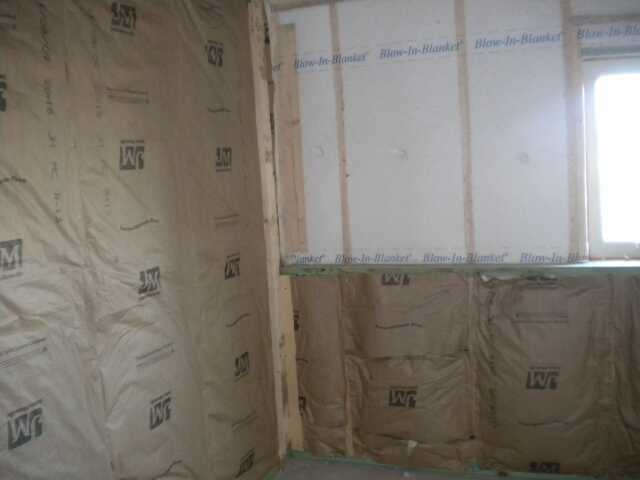 In addition to the 1” Styrofoam that was applied to the basement walls prior to starting framing, the exterior basement walls are insulated with paper faced R13 fiberglass batts. Please visit greatstuff.dow.com to learn more abot Dow Great Stuff and visti www.jm.com to learn more about Johns Mansville’s insulation products. 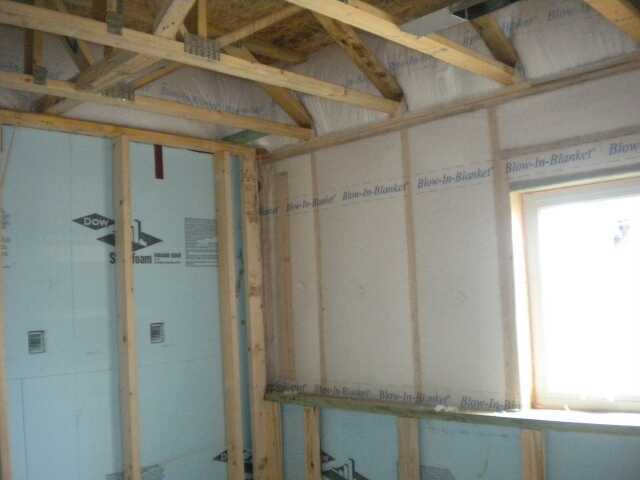 Upon completion of the insulation, another series of inspections are completed to assure compliance with the LEED® for Homes, ENERGY STAR®, NAHB Green Building, Indoor airPlus, and the Builders Challenge programs. As part of our effort to build awareness of building green in the Wichita area, Bauer & Son Construction has committed to a booth at the 2010 Wichita Area Builders Association Home Show. This will be the 56th annual Home Show, sponsored by the Wichita Area Builders Association and it will be held February 4-7 at the Century II Convention Center. More than 275 exhibitors will display a variety of products and services related to home building and home remodeling. Our booth, #921, will include four wide screen TVs, three of which will be displaying slideshows and videos showcasing our green home. The fourth TV will feature our recently redesigned web page that includes our GreenLogic program. Information about LEED® for Homes, ENERGY STAR®, NAHB National Green Building Program, the U.S Environmental Protection Agency’s – Indoor airPLUS, and the U.S. Department Of Energy’s – Builder’s Challenge will be available as well.